Original and activated Windows7 users will get a notification for upgrade to Windows10. 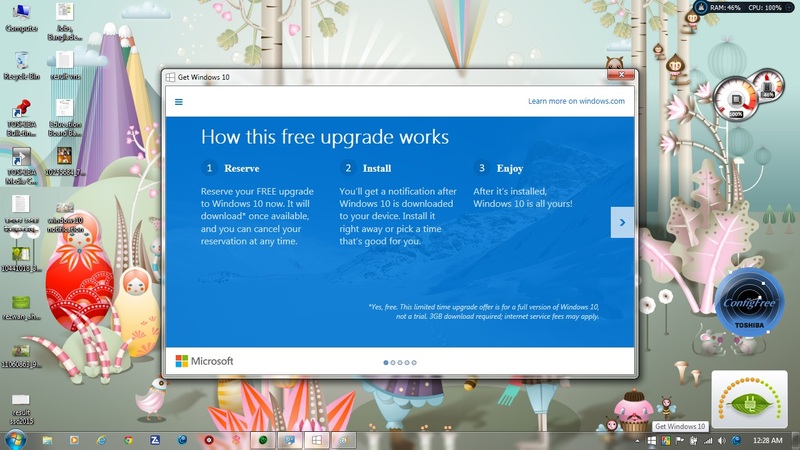 Microsoft provides this upgrade offer is for a full version of Windows10, fully free, not a trial, no cost. When a User accepts, then first time Microsoft will reserve your booking for upgrade Windows10. PC Users will get a notification after ‪#‎Windows10‬ is downloaded to desktop or Notebook device. Microsoft .Net Framework Managed Extensibility Framework, Windows Communication Foundation, Windows Workflow Foundation, and Windows Identity Foundation of your Desktop / Notebook System. The .NET Framework 4.5.2 enables out-of-process, Event Tracing for Windows (ETW) – based activity tracing for a larger surface area. This enables Application Performance Management vendors to provide lightweight tools that accurately track the costs of individual requests and activities that cross threads. Microsoft .NET Framework 4.5.2 Developer Pack absolutely use for better job processing for different service pack SP; such as Windows Vista SP2, Windows 7 SP1, Windows 8, Windows 8.1, Windows Server 2008 SP2 Windows Server 2008 R2 SP1, Windows Server 2012 and Windows Server 2012 R2. Windows 10 will run across an incredibly broad set of devices – from the Internet of Things, to servers in enterprise datacenters worldwide. 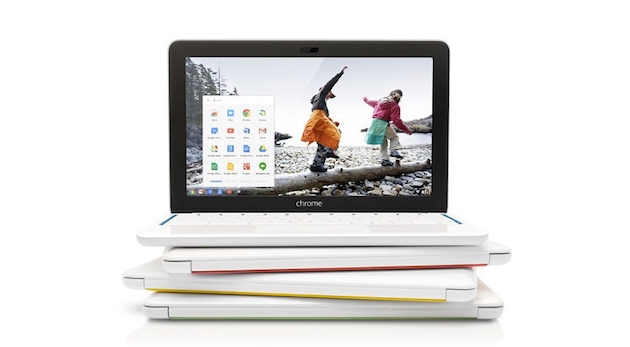 Google brings Chromebook or Google Chrome OS – Operating System – with one or two other people will be happy to download the latest Chrome OS update. The new version adds in Multi Sign-in support that makes logging on with one of a handful of different accounts a breeze. On top of that, there’s a new “App Info” view in the launcher, settings now appear in a window rather than a tab, managed bookmarks and the ability to save to Google Drive from Incognito mode. UNIX systems also have a graphical user interface (GUI) similar to Microsoft Windows which provides an easy to use environment. However, knowledge of UNIX is required for operations, which aren’t covered by a graphical program, or for when there is no windows interface available, for example, in a telnet session. There are many different versions of UNIX, although they share common similarities. The most popular varieties of UNIX are Sun Solaris, GNU/Linux, and MacOS X. Solaris on our servers and workstations, and Fedora Linux on the servers and desktop PCs. Linux is an operating system developed by Linus Torvalds under the free and open-source development and distribution. Linux is often seen as the champion of the open-source cause, being, perhaps, the most well-known example of open-source collaboration second only to Mozilla Firefox. Linux comes with various distributions, better known as “distros”. In layman’s terms, distros are different versions of operating systems based on the Linux kernel. Linux distros have taken on a variety of forms: from desktop computing to mobile phones and everything in between and beyond. Yes, that means motorised rickshaws can run Linux as well. For beginners, the distro of choice is Ubuntu. It’s the easiest to set up and perfect for learning the ropes if you’re new to the world of Linux. Is it the best distro? Well that is up to you and your needs. But if it comes to learning how the entire eco-system of Linux works, Ubuntu is the best starting point. Other distros for desktop environments worth checking out are Kubuntu, Mint, Fedora and Debian. Laptop and older system users would do well to try out Crunchbang, Bodhi Linux and Puppy Linux since they are minimalist OSs designed to use low system resources. If you’re not too keen on changing from Mac or Windows, Pear Linux and ZorinOS can make the change to Linux easier with user interfaces that resemble Mac and Windows respectively. It might be a tad overwhelming to install Linux on a system for someone who hasn’t dabbled into their computer’s ins and outs once in a while, but the installation process is pretty straightforward. I recommend downloading Ubuntu 12.04 LTS for a more stable, hassle-free version of the OS. 3. After you’re done with successfully burning the ISO image to the USB, restart your computer. It should boot automatically from the USB, but if it doesn’t press F12 on the boot menu and rearrange the boot order by moving your USB to the top. Note: You should backup ALL your data to a large number of USBs or an external hard drive before you install, or reinstall, any operating system. Linux’s open-source nature is a coin toss. On one hand it means, many commercial software like Microsoft Office or Photoshop won’t work. But on the flipside, there are more than enough able open-source alternatives. The Operating System / OS is the core of your computing experience. There’s no point trying to run a fully legal setup if the base of it is illegal. Windows and Mac OS are the most known operating systems, however they aren’t free. But Ubuntu is one of the free Operating System as well as lots of users using this OS – Ubuntu. WeBInOS is an EU funded project aiming to deliver a platform for web applications across mobile, PC, home media (TV) and in-car devices. The webinos project has over twenty partners from across Europe spanning academic institutions, industry research firms, software firms, handset manufacturers and automotive manufacturers. webinos is a “Service Platform” project under the EU FP7 ICT Programme with a budget of 14 m€ including 10 m€ of EU funding. A foundation is planned to continue the work after the end of the project in August 2013, building upon an affiliates program launched in August 2011 that seeks to attract additional organizations to help with work on specifications and platform development. The webinos project will define and deliver an Open Source Platform and software components for the Future Internet in the form of web runtime extensions, to enable web applications and services to be used and shared consistently and securely over a broad spectrum of converged and connected devices, including mobile, PC, home media (TV) and in-car units.